BOM-Stitchers Garden- A Sewing Technique Block of the Month This BOM quilt we will teach you how to use all your accessory feet plus sew much more!!!!!!! 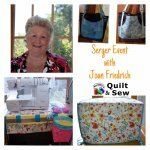 For all you who enjoy Quilting, here is an opportunity to come, hang out and quilt with others. Come with your projects and have the support of our staff should you need it. If you have questions or just need some advice, you will find it here. Come and join us and the best part - It is FREE!!!! 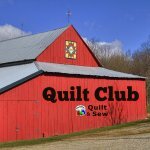 Join the QOV local chapter on the first Saturday of every month at Marietta's Quilt & Sew Make a Quilt of Valor (QOV) A Quilt of Valor is our award to those who have been touched by war. It says "thank you for your service, sacrifice and valor" in serving our nation. 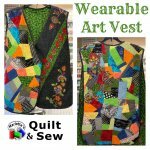 Quilts of Valor are to reflect the best possible workmanship and use of quality materials consistent with the Foundation's core value of promoting excellence. 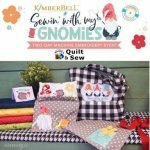 Kimberbell BOM- Broomhilda?s Bakery Quilt This is for sewing and embroidery versions. Total of 6classes. You will finish in May...plenty of time for Halloween! 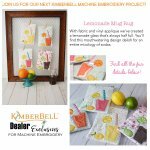 Kimberbell Exclusive Club - May Lemonade Mug Rug With fabric and vinyl applique, we've created a lemonade glass that?s always half full. Stitch the quilted pennant background in a contrasting color for celebration or blend with the background fabric to emphasize the drink and slice of citrus garnishing the cup, like our cherry cola with lime. You?ll find this mouthwatering design delish for an entire mixology of sodas. 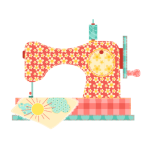 Floriani Embroidery Event- Enjoy three days of ideas, prizes , and FUN!! !